Photographed near Robbins Butte, Maricopa Co., Arizona. 08 March 2008. A higher resolution photograph has been added to Wikimedia Commons. The ink pen is for scale comparison. 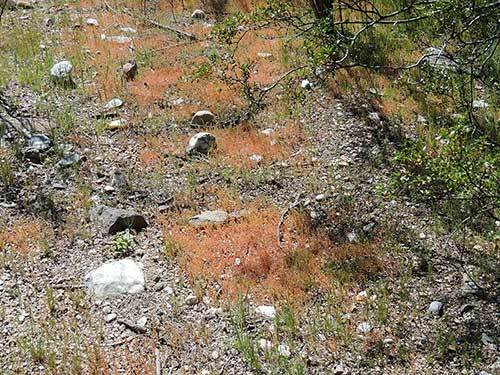 Shallow pans where water collects temporarily can become covered with hundreds of these minute plants. Superior, Pinal Co., Arizona. 12 March 2017. ANNUAL: Minute, succulent herb grows in patches along desert washes after spring and summer rains. Soon changes from green to coral red. LEAVES: Leaves are paired at each node and are joined across the stem, i.e. they are perfoliate. 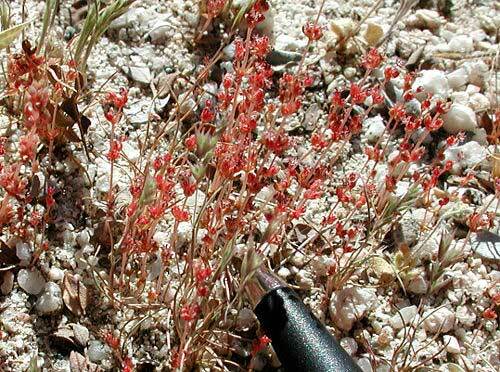 RANGE: Fairly common in the Sonoran Desert in Arizona and Mexico, however its very small size may leave it unnoticed. FRUIT: Dry several-seeded capsules encircled by winged bracts. FLOWERS: Several small flowers clustered at each leaf node. Greenish-red with four sepals and four petals.